Beebe Medical Foundation recently closed out the traditional season of giving with its Holiday of Life program, raising more than $12,700 in support of Beebe Healthcare’s Women’s and Children’s Health Services. Hertrich Toyota again generously supported Beebe and the Holiday of Life as the Gold Star sponsor. More than 125 donors recognized hundreds of loved ones, whose names were displayed on a tree beautifully decorated by the Women’s and Children’s Health patient-care team, captained by Bridget Buckaloo, MSN, RNC-OB, Executive Director of Women’s and Children’s Health, and Lydia Martin, RN, clinical nurse with Women’s and Children’s Health. 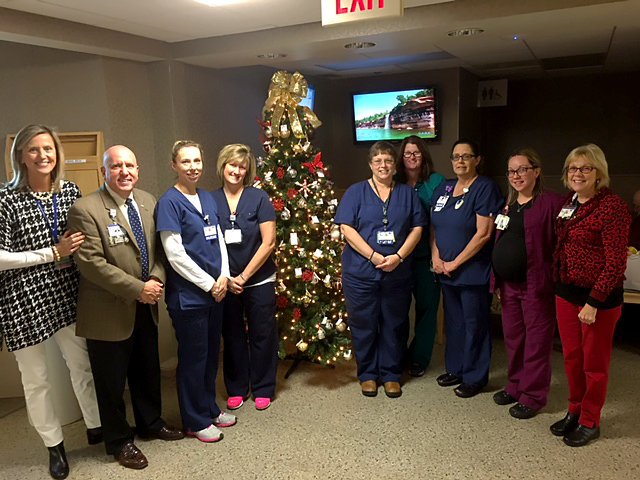 The Holiday of Life tree, along with a listing of all those who made tax-deductible donations to support Women’s and Children’s Health Services at Beebe, were proudly displayed on the second floor of the hospital. “The community’s support truly helps Beebe save and change lives every day,” Aliquo said. Contact the Beebe Medical Foundation at (302) 644-2900 or foundation@beebehealthcare.org to make an honorary or memorial donation to Beebe Healthcare in 2017. For more information about supporting your local, not-for-profit healthcare system, go to www.beebemedicalfoundation.org. Thank you for giving where you live. Beebe Medical Foundation was established in 1989 with the sole mission to raise philanthropic support for Beebe Healthcare. The Foundation is located at 902 Savannah Road, Lewes, DE 19958. To learn more about how you can give, please contact the Beebe Medical Foundation at (302) 644-2900 or visit the Foundation online at https://www.beebemedicalfoundation.org. Caption: Shown (left to right) are Bridget Buckaloo MSN, RNC-OB, Executive Director of Women’s and Children’s Health Services at Beebe Healthcare; Tom Protack, Vice President of Development, Beebe Medical Foundation; Courtney Stoeckel, RN, Dawn Dean, RN, Kathy Adams, RN, Laura Holloway, NNP, Mary Koyanagi, RN, and Kristal Murillo, CNA, all of Beebe Women’s and Children’s Health Services; and Judy Aliquo, President & CEO, Beebe Medical Foundation.